..WATER STATUS UPDATE as of January 29, 2015.. 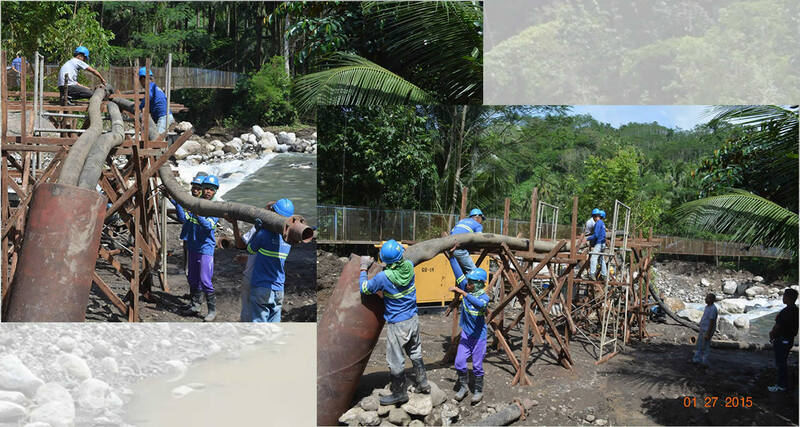 The Butuan City Water District (BCWD) installed a temporary by-pass pipeline skipping the Infiltration Gallery. The purpose for said installation is to temporarily tap water from the Taguibo River with the aid of two (2) units 25 horsepower water pump powered by a generator to the transmission line going to the Filtration Plant. The capacity for the temporary by-pass pipeline is around 600 cubic meters per hour. This by-pass line is simultaneously operated with the six (6) pumping stations to be able to produce 100% capacity to supply the demand of 1,200 cubic meters per hour. However, operation of the temporary by-pass line will be suspended every 10 o’clock in the evening up to 4 o’clock in the morning as this span of time is considered as non-peak hours. This will give ample time to check the water pumps and generator to ensure that there will be no hick-ups in the operation. Also during rainy weather condition, the operation of the temporary by-pass line will be suspended as it is susceptible to the strong current of the river as well as the sediments and sand that goes along with the river water. Meanwhile, BCWD is also preparing the materials needed for the installation of the permanent by-pass pipeline. The permanent by-pass line will provide the 100% water supply needed while the rehabilitation works of the Infiltration Gallery will continue. The said by-pass line will tap water from the upstream of the Infiltration Gallery with a distance of 175 meters. Water will then flow by gravity. Upon operation of this by-pass line, pumping stations will only be activated when necessary. The installation of the by-pass pipelines is part of the strategies drawn by BCWD to address the demand for water supply after the Typhoon Seniang. Installation of the by-pass line took some time due to the variable weather condition at the Taguibo River Watershed Forest Reserve. Aside from that, to be able to assess the extent of damage of the Infiltration Gallery, there is a need for the declogging of service manholes. Only after one of the manholes were partially cleared that the development of strategies took place and part of the said strategies to be implemented was the installation of the by-pass line as temporary means of extracting water from the Taguibo River. BCWD would like to extend its sincerest apologies to all its concessionaires for the inconvenience caused while trying to revive the operation of the BCWD after Typhoon Seniang.